Our Scale Models been used for Trade Show Displays, Trade Show Give-Aways, Sales Demonstrations, Architectural Design Presentations, and Direct Mail Promotions. The team has advanced degrees in Engineering and can design models ranging from a simple Doll-House Railroad to a complex jet engine turbine rotor. Perceptions has also developed a line of paper model kits called The Great Trains of the World which is being distributed internationally. 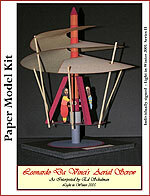 Paper Model Kits representing your product, service, or campaign can be distributed via the internet or incorporated into standard brochures, ads, or flyers for a more spectacular and lasting presentation. Leonardo Da Vinci's "Aerial Screw"